XLR Connectors are used almost universally as a balanced audio connector for microphones and connections between audio equipment. 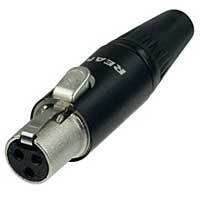 The 3-pin XLR is the most common for those applications. 4-pin and 5-pin XLR connectors (with four or five pins) are typically used for applications such as Telex intercom headsets and handsets, some DC power connections and older AMX analog lighting controls.These new TINY XLR cable end connectors are great for applications such as battery beltpacks, or other applications where reduced size XLRs are beneficial.